My first time over at Dorsett Regency Kuala Lumpur, and it was to be a dinner affair at their Checkers Cafe. In conjunction with the month of November, Checkers Cafe's food theme would be the Opulence of East & West. Various dishes ranging from salmon, lamb, and a medley of grilled meats and seafood were laid out for diners to savor. All the dishes were prepared by Executive Chef Yau and his team for our indulgence that evening. We had savoury dishes at the buffet spread while enjoying one main course for a price of RM60++ for dinner and RM70++ during lunch time. Now I got pretty excited when I saw the choices we had for the main course. Check them out below. The first dish that appeared was Checkers Cafe's Chicken Schnitzel with Avocado Mousse and Mornay Prawn. It sort of reminded me of a certain seafood and poultry mix from another place I dined at. They named it surf & turf though. Here, the chicken schnitzel was a delight to have, being crispy on the outside, and coupled with the rather big prawn, you get the best of poultry and seafood in one dish. 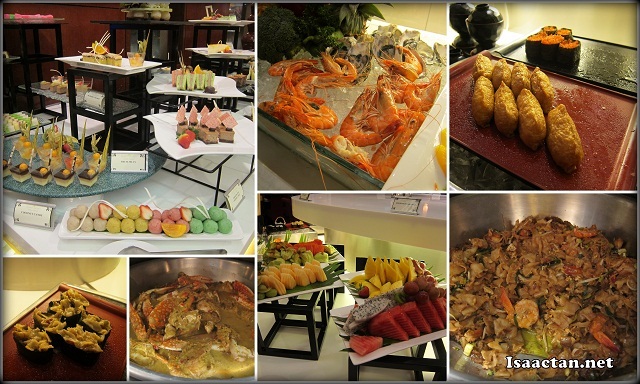 For the fish lovers, by all means choose these two dishes as your main course to go with the buffet spread. I have always preferred meat over fishes, but here the Barramundi Fish Fillet on Risotto and Slow roasted vegetables and the Grilled Salmon with Teriyaki Sauce and sautéed vegetable and garlic flakes really wowed me over. Janice did mention the Barramundi Fish Fillet tasted really nice as it was done just nice without being too dry nor hard. Up next was their Australian Lamb Shoulder Chop with Peppery mint Sauce, lamb shoulders on a skewer. I did enjoy the lamb, as it was marinated just nice without any strong smell. Good stuff here, but I was still waiting for the last dish to be served, my all time favourite beef. The presentation of the Sous Vide Eye of Beef Rump served with horseradish and Miso Sauce was definately inviting. I couldn't wait to sink my teeth into that juicy piece of meat. Probably my expectations were a tad too high, as I actually felt that the piece of beef rump was too dry and not juicy enough. Maybe I should have chosen medium rare over the medium which I requested for. We ended the meal with some desserts from Checkers Cafe buffet spread. They do have a really wide variety of sweet desserts. I did like the ice-cream prepared by Janice though, as it looked really pleasing to the eye. Checkers Cafe of Dorsett Regency is also having this cost saving lunch menu which offers a potpourri of appetizer, main course and dessert choices. Healthy appetizers at RM20++, hearty main course at RM30++, and delightful desserts at RM20++ per person which includes coffee or tea. A special 20% discount is applicable for the month of November for diners having the selection of Healthy Appetizers, Hearty main course, or Delightful Dessert. Oh? So you have a choice not to have everything and you pay less? That's nice. Hmmm...food looks great - you treat me to dinner there when I go to KL, can or not?